January 24, 2019 11:28 am. Cambridge trainers Murray Baker and Andrew Forsman will get a better idea of the strength of their Group 1 New Zealand Derby (2400m) hand after racing in the coming days. The champion training duo still have seven three-year-olds in reckoning for the Derby at Ellerslie on March 2, with five of that contingent racing between Friday and Monday. Dual Group One winner Madison County will look to add to his winning sequence when he tackles Saturday’s $1 million Karaka Million 3YO Classic (1600m) at Ellerslie, while Cutadeeel and The Chosen One are slated to race at Pukekohe on Friday and Bobby Dee and Fiery Dragon entered for Te Teko on Monday. Savabeel colt The Chosen One resumed with an encouraging second to Group One winner Sword Of Osman at Ellerslie earlier this month and he should relish the step up in distance of the Splice Construction 1400 at Pukekohe. “He’s just getting going again after a break. He was only out for three weeks so didn’t lose much fitness and we were very happy with his run at Ellerslie,” Baker said. Baker said The Chosen One could then step up to a middle distance of either the Gr.2 Waikato Guineas (2000m) on February 9 or wait a week later for the Gr.2 Avondale Guineas (2100m) at Ellerslie. Dundeel gelding Cutadeel will also contest either of those races should he run as well as expected in the Rogers Racing Stables 1600 at Pukekohe. “We’re very happy with Cutadeel. He’s going well,” Baker said. Baker remains unconvinced Madison County is a Derby horse but he’s happy for the Pins gelding to guide him with his performance in the Karaka Million 3YO Classic. 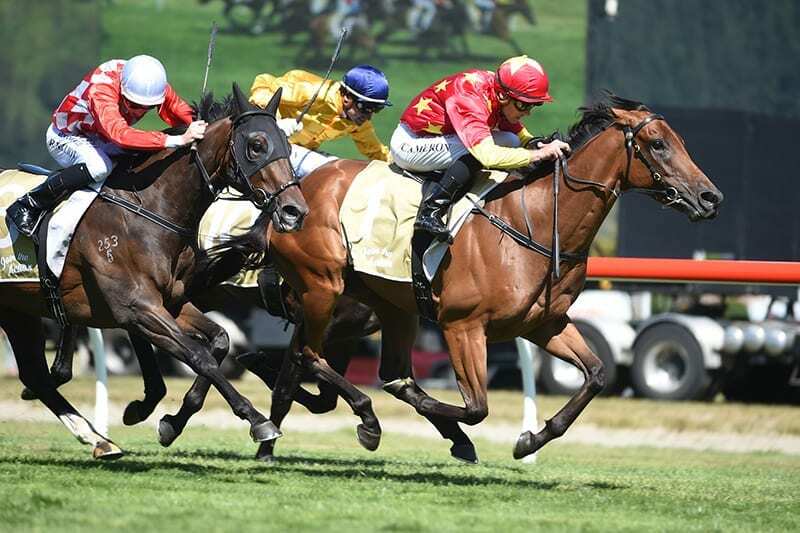 Shooting for a third straight big-race win after success in the Gr.1 New Zealand 2000 Guineas (1600m) at Riccarton and this month’s Gr.1 Levin Classic (1600m) at Trentham, Madison County opened a $2.70 favourite for his weekend assignment. Baker and Forsman’s filly is Queen Of Diamonds, an easy Gr.3 Eulogy Stakes (1550m) winner at Awapuni before finishing third in last month’s Gr.2 Eight Carat Classic (1600m) on a rain-affected Ellerslie track. She is an $11 equal fourth favourite. At Te Teko on Monday, Bobby Dee and Fiery Dragon need to perform boldly to remain in Derby contention. “Bobby Dee has had a short break since Ellerslie, but he should run well at Te Teko,” said Baker, whose other two Derby entrants are Lord Arthur and Clementina. Other runners of note for the stable over the weekend are Group 3 Waikato Cup (2400m) winner Mongolian Marshal and Gundown tackling the CollinsonForex Karaka Cup (2200m) at Ellerslie and the Pukekohe clash of Taupo Cup winner Camino Rocoso and True Enough, searching for his fourth straight win.